Fences and walls erected along international boundaries in the name of national security have unintended but significant consequences for biodiversity (Trouwborst et al. 2016). In North America, along the 3200-kilometer US–Mexico border, fence and wall construction over the past decade and efforts by the Trump administration to complete a continuous border “wall” threaten some of the continent’s most biologically diverse regions. Already-built sections of the wall are reducing the area, quality, and connectivity of plant and animal habitats and are compromising more than a century of binational investment in conservation. Political and media attention, however, often understate or misrepresent the harm done to biodiversity. We call on fellow scientists to join us in expressing unified concern over the border wall’s negative impacts on wildlife, habitat, and binational collaboration in conservation and ­scientific research. Below, we describe three ways in which border infrastructure and security operations (hereafter “the border wall”) threaten biodiversity, and we outline actions to minimize these threats. In 2005, the US Congress passed the Real ID Act, which gives the Department of Homeland Security (DHS) authority to waive any laws that slow the wall’s construction, including the Endangered Species Act (ESA) and the National Environmental Policy Act (NEPA). With these laws sidelined, wall construction proceeds without the necessary depth of environmental impact analysis, development of less-damaging alternative strategies, postconstruction environmental monitoring, mitigation, public input, and pursuit of legal remedies. Since 2005, the DHS has issued eight waivers in all four US border states, including three by the Trump administration in 2017 for construction in California and New Mexico. The US–Mexico borderlands traverse six ecoregions (figure 1) containing vegetation types that include desert scrub, temperate forests and woodlands, semidesert and plains grasslands, subtropical scrublands, freshwater wetlands, and salt marshes. These environments span portions of a broad Nearctic–Neotropical transition zone and support extraordinary biological diversity. Our analysis shows that the border bisects the geographic ranges of 1506 native terrestrial and freshwater animal (n = 1077) and plant (n = 429) species, including 62 species listed as Critically Endangered, Endangered, or Vulnerable by the International Union for Conservation of Nature (IUCN) Red List (supplemental appendix S1, supplemental table S1). 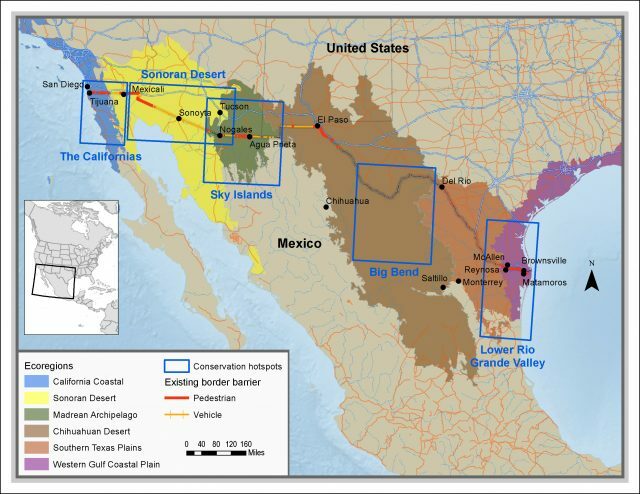 Five Borderlands Conservation Hotspots identified by Defenders of Wildlife represent top-priority areas of high biological diversity and ­binational investment in conservation that are threatened by border wall construction (figure 1; Peters and Clark 2018). The five Borderlands Conservation Hotspots identified by Defenders of Wildlife, which highlight areas of high biological diversity and significant investment in conservation land and projects. See Peters and Clark (2018) for more information. Like any large-scale development, construction of the wall and associated infrastructure, such as roads, lights, and operating bases, eliminates or degrades natural vegetation, kills animals directly or through habitat loss, fragments habitats (thereby subdividing populations into smaller, more vulnerable units), reduces habitat connectivity, erodes soils, changes fire regimes, and alters hydrological processes (e.g., by causing floods). As of 2017, the DHS had constructed 1050 kilometers of “primary” pedestrian and vehicle barriers serviced by 8000 kilometers of roads, as well as many thousands of kilometers of undesignated routes created by off-road patrol vehicles. Human activity, light, and noise associated with the wall further displace wildlife, making additional habitat unavailable. The border wall threatens some populations by degrading landscape connectivity. Physical barriers prevent or discourage animals from accessing food, water, mates, and other critical resources by disrupting annual or seasonal migration and dispersal routes. For example, continuous walls could constrain endangered Peninsular bighorn sheep (Ovis canadensis nelsoni) from moving between California and Mexico to access water and birthing sites. It will be likely impossible for endangered animals such as the Mexican gray wolf (Canis lupus baileyi) and Sonoran pronghorn (Antilocapra americana sonoriensis) to disperse across the border to reestablish recently extirpated populations or bolster small existing populations. As climate change and increasingly warm, dry conditions redistribute resources and shift habitats in the borderlands, the wall may prevent some populations from tracking these changes. Fragmented populations may suffer from reduced genetic diversity and face greater extinction risks. A continuous border wall could disconnect more than 34% of US nonflying native terrestrial and freshwater animal species (n = 346) from the 50% or more of their range that lies south of the border (figure 2; appendix S1). If cut off by a border wall, 17% of the 346 species we analyzed, including jaguar (Panthera onca) and ocelot (Leopardus pardalis), would have residual US populations covering 20,000 square kilometers or less (Table S1). This would elevate their risk of extirpation within the United States according to IUCN Red List criteria (table S1; appendix S1). The percentage of species ranges that may become inaccessible to US species after construction of a US–Mexico border wall. 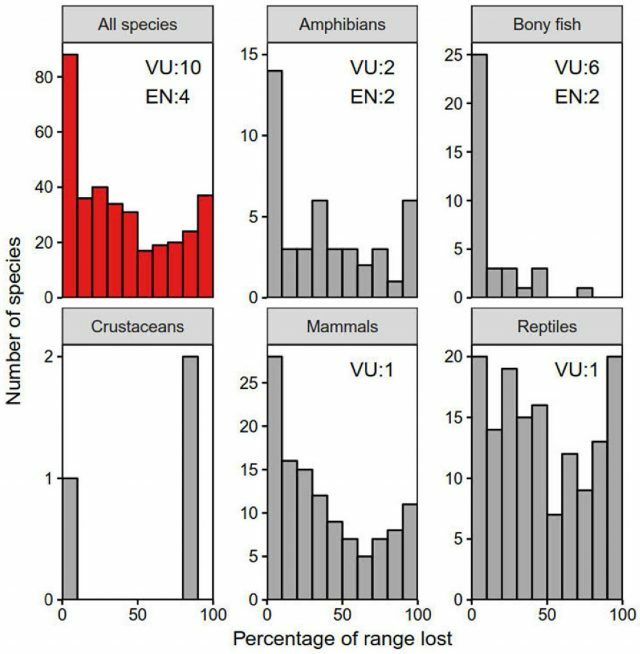 The number of species ranked in the IUCN Red List as Endangered (“EN”) or Vulnerable (“VU”) are shown by taxonomic group. Species include nonflying native terrestrial and freshwater animal species with spatial range data available in the IUCN Red List (n = 346). The percentages represent the amount of species’ total ranges located south of the US–Mexico border. Border barriers could also ­hinder some low-flying species, like the ­ESA-listed endangered Quino checkerspot butterfly (Euphydryas editha quino) and the ESA-candidate ferruginous pygmy-owl (Glaucidium brasilianum; Flesch et al. 2010). Over long periods, degradation of landscape connectivity can also drive genetic discontinuities in plants and animals. Although the influence of barriers on populations depends on both a species’ movement ability and the quantity, quality, and spatial arrangement of habitats, for many species, the biological impacts of a “wall” are comparable to those of a “fence.” What matters is whether the barrier is passable, and from a jaguar’s point of view, an uncrossable fence has the same effect as a wall. The US and Mexican governments, tribes, nongovernmental organizations, and private landowners have set aside many millions of acres of protected land and invested millions of dollars in conservation, often binationally coordinated (Peters and Clark 2018). Within 80 kilometers of the border, 4.5 million hectares of US and Mexican protected areas are managed for biodiversity conservation (comparable to IUCN Protected Areas Categories I–IV) in addition to 2.6 million hectares managed for sustainable multiuse (IUCN Categories V–VI; supplemental appendix S2). In total, 18% of the borderlands contain protected lands. This includes four clusters of protected lands that sandwich a total of 400 border kilometers to create contiguous binational habitat corridors through the Sonoran Desert, Sky Islands, Big Bend, and Lower Rio Grande (figure 1). Numerous binational collaborations have also targeted specific species, such as the binational aerial census of endangered Sonoran pronghorn. The wall places such investments at risk by undermining their objectives and diverting funds away from conservation projects and toward barrier construction. The wall and associated security operations also obstruct scientific research. US and Mexican scientists have shared distressing stories of being intimidated, harassed, and delayed by border security officers (Peters and Clark 2018). Binational meetings and other collaborative activities become inconvenient and constrained by the hours required to pass border security checkpoints. These factors diminish the amount of much-needed scientific work conducted in the borderlands. This is especially concerning given that the waiving of environmental laws means independent research may provide the best source of scientific insight into the wall’s impacts on biodiversity. First, the US Congress should ensure that the DHS follows the sound scientific and legal frameworks of US environmental laws, including the ESA and NEPA. Any future appropriations for border barrier construction and operations should require adherence to all environmental laws and preclude their waiver. In areas where the DHS has already issued waivers, we call on the DHS to carry out analysis, mitigation, and opportunities for public participation as prescribed by all relevant environmental laws. 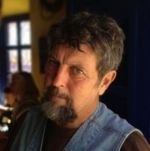 Second, for any barrier construction or security operations, the DHS should complete rigorous preplanning and preimplementation surveys to identify species, habitats, and ecological resources at risk, and they should work closely with pertinent Mexican and US government agencies, tribes, private landowners, the scientific community, and other stakeholders to gather such information. Third, the DHS should mitigate as completely as possible any environmental harm resulting from projects. Mitigation should include forgoing physical barriers in places with high ecological sensitivity, such as cross-border corridors or critical habitat for endangered species. Wherever possible, border barriers should be designed for maximum wildlife permeability, including the use of vehicle barriers instead of pedestrian barriers. When harm to biological resources is inevitable, the DHS should implement mitigation measures to ensure no net environmental loss, such as by purchasing or restoring replacement habitats. Fourth, the DHS should facilitate scientific research in the borderlands to complement and assist environmental evaluation and mitigation efforts. This should include training Border Patrol agents to be sensitive to the presence of researchers and briefing Border Patrol agents when independent scientists will be working near the border. We urge the US government to recognize and give high priority to conserving the ecological, economic, political, and cultural value of the US–Mexico borderlands. National security can and must be pursued with an approach that preserves our natural heritage. We are immensely grateful to the 2500+ scientist signatories across the Earth who endorsed this article. In the continuing spirit of binational collaboration, we received 1470+ scientist signatories from the United States and 610+ from Mexico, demonstrating in real-time the deep concern felt by scientists in border countries. The broader, global representation of scientist signatories from 43 countries (and counting) speaks to the worldwide impacts of border barriers on biodiversity and to scientists’ unified call for political leaders to consider wildlife when making national security decisions. In recognizing that the threat of border barriers to biodiversity is long term and widespread, we continue to welcome signatories to join and further strengthen our united voice of concern. Visit www.defenders.org/border-wall to sign and to view the updated signatory numbers and names. A Spanish version of the article is available in supplemental file 3. Supplementary data are available at BIOSCI online.